Every person living in a civilized state has been given certain rights by the law. Infringement of these rights gives rise to another right i.e. the right to sue the person who infringed those rights. 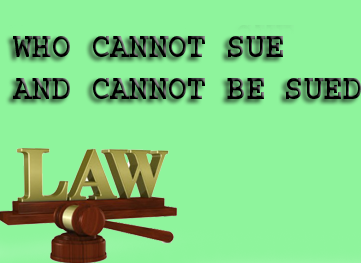 This right to sue is known as the capacity of an individual where capacity indicates the competence of parties to sue and the liability to be sued. In torts however there are certain persons who can sue but cannot be sued. Certain who cannot sue but can be sued and yet another group which can neither sue, nor sued. There are certain persons or bodies who cannot sue, whist there are others who cannot be sued in tort. In a tort there is certain person or bodies who cannot sue, whilst there are others who cannot be sued. These persons are discussed in the detain below. As a general rule every person who suffers a tort can sue and a person who commits a tort can be sued” this general rule is based on equality in law and equal protection in law guaranteed as a fundamental right by Article 21 of Constitution of Pakistan, 1973. An alien enemy means a person of alien nationality and includes a person of any nationality who is at war with the state. An alien enemy in England cannot sue in English Court except under a express licence of the Queen. Alien enemy residing in Pakistan can; however sue with the permission of the Federal Government u/s. 83 of civil procedure code. An Indian citizen cannot file suit in Pakistan for enforcement of his fundamental rights. A child cannot sue for injury caused when in its mother’s womb. A women was with child, was injured in a railway accident, and the child when born was found to be deformed. The infant claimed 1,030 as damages from the railway company. It was held that the infant child cannot maintain an action. A convict is a person against whom judgment of death or penal servitude has been pronounced on any charge of treason or felony. A married women cannot sue for any tort committed by the third person unless her Husband joins her a plaintiff. Now with the change in the law by law reform (Husband and Wife) Act 1962 husband and wife can sue each another. In Pakistan husband & wife can file suit against one another because her husband and wife are considered separate personalities. A bankrupt is similar under a disability to sue for wrongs in respect of his property for his bankruptcy all his property vests in a trustee. Unincorporated association cannot sue in its name. So the companies which are not registered under companies’ ordinance 1984 or firms which are not registered under companies’ ordinance 1984 or firm which are not registered under the partnership act 1932 cannot sue. Foreign sovereigns cannot be sued. It is a fundamental principal can do not wrong. Mighel vs. Sultan of Johore (1894). Under international law sovereign can waive his immunity. Ambassadors are diplomats cannot be sued in a country where they are posted. This immunity is available under the international law to them. Public officials cannot be sued in their representative capacity for the torts committed by them or by their representatives. The corporation incorporated under companies’ ordinance 1984 cannot be sued for tort requiring physical though like tort of assault. King or his servant cannot be sued for torts committed by them. Under constitution of Pakistan 1973, the president, prime minister, governors, chief ministers and ministers cannot be sued for torts committed by then while they hold for their office. In the end we can say that it is a general principal that all persons have capacity to sue and are liable to be sued. It is subject to certain limitation under the law of torts. There are some persons who cannot sue but cannot be sued for torts.